Since the performance of built-in iPhone camera app, more and more users like to take photos with their iPhone than a digital camera. Thus, camera editing apps on iPhone also become more and more welcomed in the iTunes or App store. iPhone users also changed their role from simply taking a picture with the device, to customize or personalized your photos with various effects, including adjust brighter, add blur effects and spot healing, etc. So in this page, we have collected and picked up several best iPhone photo editing apps for your reference. 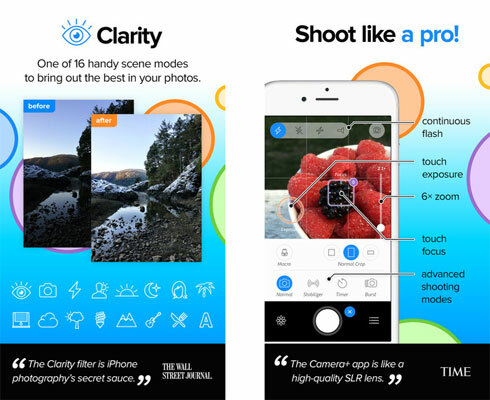 Camera+ is a combined photo editing and camera app, which contains a number of features like white balance, exposure compensation, separate focus and exposure locks. And it provide users with 5 major editing categories: Crops, Scenes the Lab, Frames and Filters. Each of these categories has different tools as well as options for one to choose from. For example, the Scenes tool will automatically adjust the color and exposure based on a number of presets like Cloudy, Sunset, Shade and Backlit while the Lab hosts a variety of slider adjustment for the exposure, sharpness, and color as well as straightening, rotating and vignette tools. What's more, Camera+ also has a variety of filters with useful preview screens that show how the images would look with every filter. This is an app for a happy balance between the adjustment tools and filters. Afterlight is more than just tasteful filters. There are a lot of crop, adjustments and transformation tools in the program, so that you can use it to edit your photos as you like. Most of these tools are also available in Photos app thanks to the extensions. This app is favorite for quick editing because it is available right in the Photos app. This is a super-fast editing tool that has unlimited possibilities. Snapseed enables you to adjust any part of a photo and then layer the photo over more adjustments. You can add filters and adjust focus according to your own needs. It might not be as advanced as other photo editing apps available in the market, but Snapseed is super simple to use and also offers a lot of possibilities at the same time. This is an app that allows you to edit, synchronize and share photos all in one. VSCO Cam is not just an editing app but also replaces the stock Camera application in case you wish to. It also allows users to synchronizes all the photos that you have edited to your other devices with few clicks. If you wish to find an all-in-on photo app for iPhone, then, you can't miss the program at all. This is a photo editing app which is bold, fun and features colorful filters. Colors enables you to apply a variety of bold filters to the existing photos and also preview live filters while taking new photos. You can apply different colored filters to a single photo and make edits all in one place. If you are hoping to have fun with your photos, then Colors will definitely deliver. After editing photos on iPhone, you may wish to export them to your desktop computer for further sharing, right? Then you may need to get the MobiKin Assistant for iOS (Free) to transfer photos from iPhone to computer easily.